An optimized webpage does not use excessive amounts of memory, and it runs fast. When you resize your page, it seems slow and it stutters. You’ll need to examine various types of data to ensure that your webpage performs well. 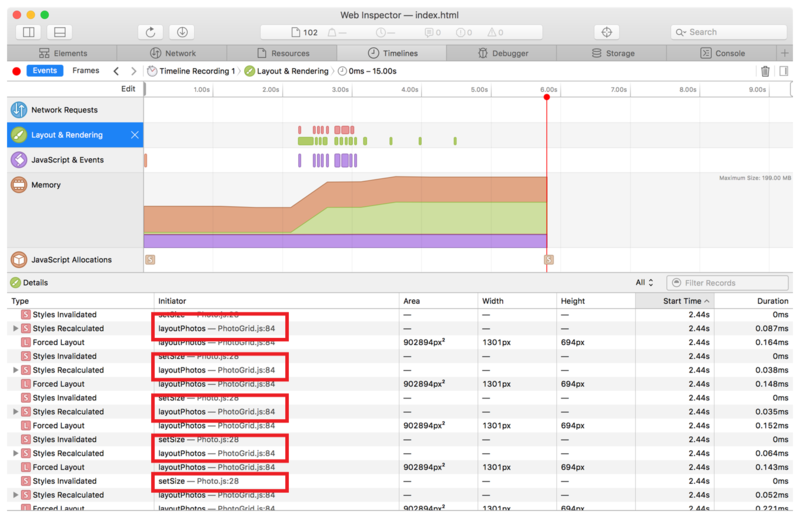 When you reload the page, you see that the values in the dashboard of Web Inspector are updated. Besides the three rightmost icons that indicate console messages, statistics are available to help you analyze your page. The figure below shows that these statistics include the time and space costs of your webpage. Note: The total values appear only when you reload the page. 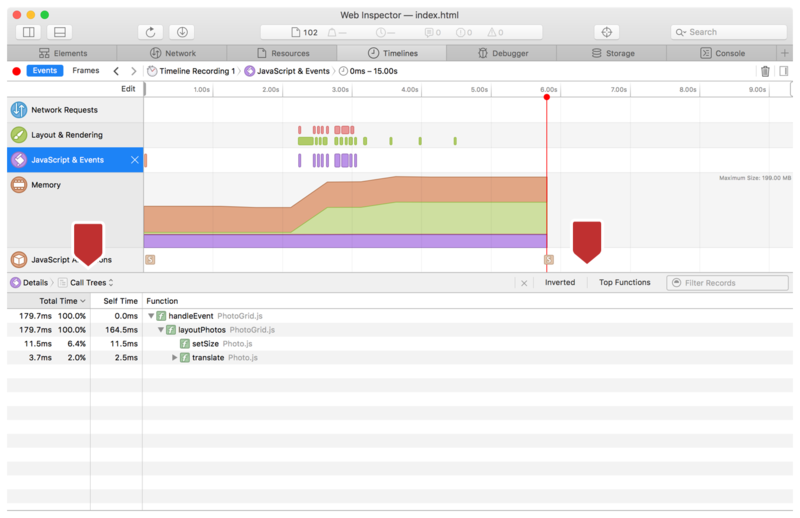 In Web Inspector, go to the Timelines tab. In the left sidebar, click the Edit button at the top right and select the checkboxes for all of the timelines. Important: This is not recommended in usual practice. Enabling all timelines can significantly affect the performance of your webpage, which will skew timeline results. Usually, you will only enable a few timelines as needed. However, to help you understand the data about your webpage, all timelines are enabled and described in the subsections that follow. Click the red Record button at the top left of the tab (see the figure below). Stop the recording by clicking the Record button again. Once you are on the Timelines tab, every time you reload the page, a new timeline recording will automatically start. You can switch between these recordings by clicking on the Timeline Recording in the jump bar. Important: The Timelines tab contains a lot of data, and some of it is hidden by default because of Web Inspector’s default size. You can detach Web Inspector from the webpage by clicking the detach button in the top left of Web Inspector. 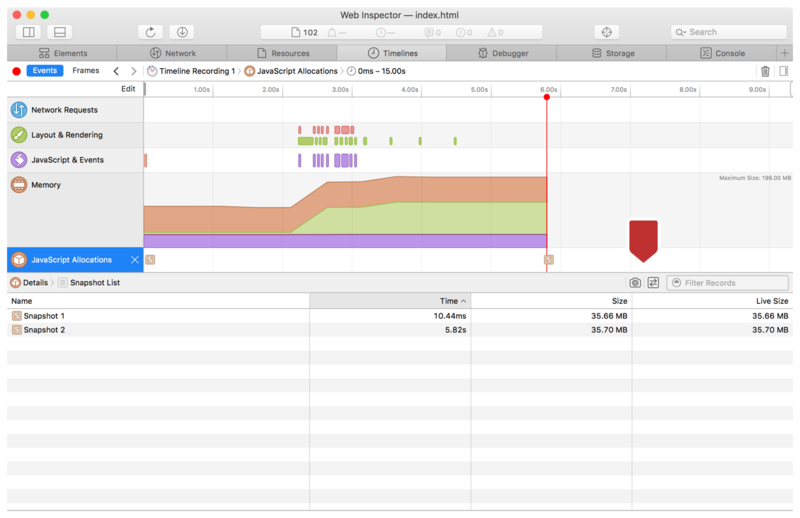 Alternatively, you can resize Web Inspector to make it bigger. Events View: This view is selected by default in the left sidebar. In this view, each data point indicates a distinct event triggered during the reload of the page. 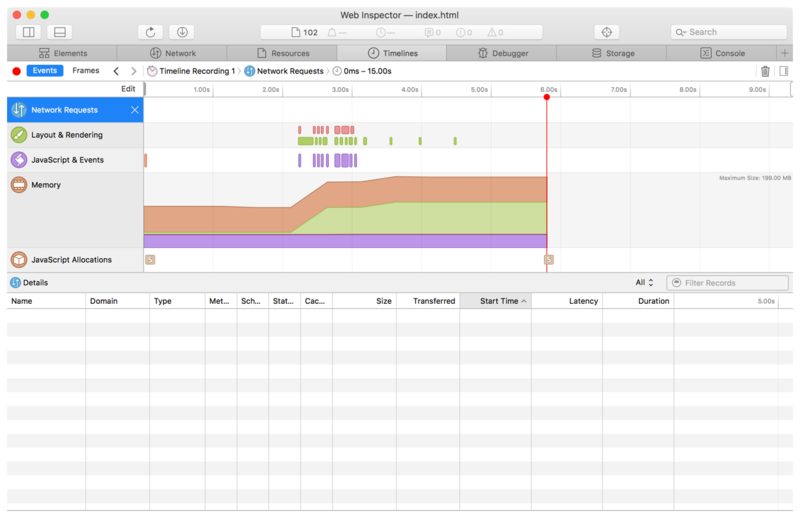 (The exception to this is Memory, which shows a contiguous line of memory usage.) If you hover over the time ruler above the data point graph, you can drag and select a subset of frames from the graph, to examine a specific section of frames more closely. Looking at this section can reveal slow callback handlers, slow timers, or slow script initialization. Frames View/Rendering Frames View: This view shows a bar graph, where each bar represents a rendered frame of activity during the reload process. Below this bar graph is a list of the frames, each of which can be expanded to show the individual events fired. Notice that when you switch to Frames View when examining any timeline, the jump bar at the top of the Timelines tab indicates that this view is also called Rendering Frames. In this view, purple is used for scripts and event timers, red is used for layout and rendering, and gray is used for background engine work. The goal is to keep each of these frame bars underneath the middle line, which indicates 60 frames per second. As you can see from your resizing recording, you are far above 60 frames per second, so you will need to fix this in the next section. Similar to Events View, you can drag and select a subset of frames from the graph to examine a specific section of frames more closely. If you select this timeline in the left sidebar, the Details section at the bottom of the Timelines tab changes (if you cannot see the Details section, enlarge Web Inspector). This timeline shows all of the requests made to get the files and resources for your webpage. The metadata includes how long it took to get each resource, the size of each resource, and the latency of the server. There is also a filter feature so you can examine certain resources more closely. In your recording, you don’t see any network requests, because all the resources were already loaded when you resized the page. If you would like to see the network requests section populated with data, try recording during a page reload. In this timeline, you can see the composite layering and the layout changes that occurred during your recording. It seems that there is an enormous amount of activity happening around line 84 in the layoutPhotos function. Later in this tutorial, you’ll examine the time spent in this function more closely. The Details section gives you two subview options: Events view (the default) and Call Trees view. Events view shows a collapsible list of triggered events, and Call Trees view shows the recorded cumulative time used to execute functions in the call stack. In Call Trees, the default view is Top Down, which you can use to look through the call tree to uncover functions that take a lot of time to execute. You can change to the Inverted view or the Top Functions view to better see the functions that are sampled most often. In the recording, only one event, layoutPhotos, was triggered. This event calls setSize and translate. 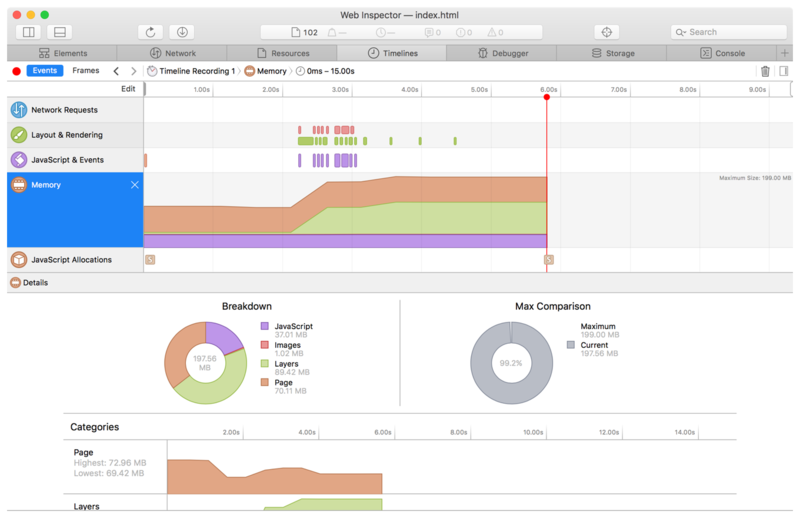 In your recording, most of the variation in memory usage happens for layers and for page memory. By default, a snapshot is taken every 10 seconds, once at the beginning of the recording, and once at the end. However, you can manually take snapshots during the recording period with the Take Snapshot button (the camera icon at the top right of the Details section). Next to this button is the Compare Snapshots button, which, when selected, allows you to examine two snapshots side by side in greater detail. In the recording are two snapshots, each indicated by a square “S” icon. One snapshot was taken shortly after the beginning of the recording, and one was taken at the end. Navigate to the Resources tab and open the PhotoGrid.js file. Add console.time("layoutPhotos"); as the first line of the layoutPhotos function. Add console.timeEnd("layoutPhotos"); as the last line of the layoutPhotos function. Make sure the label names match. You can see that the amount of time to run this function is well over 16.67 ms. For smooth animation, an optimal webpage should take no more than 16.67 ms to complete all of these events. It looks like the statements that are causing the problem start at line 84. What follows this line is a block of values that need to be calculated only once, not in a loop. If you put these statements before the loop, save the file, and resize the window, you will see a dramatic improvement in the time output to the console.